Beaducation: The Blog: A little bird told me... that you might like to win something. A little bird told me... that you might like to win something. Okay, check it out. Danelle has been at it again! Perfect for summer! How cute is that necklace? Click on the pic to see it closeup. She took the 1.25" sterling silver pendant and stamped a random border using the Dotty Diamond design stamp and stamped the word "joli" using the 1/16" letter set. The tiny flower was stamped with the bulls-eye stamp and the oval was stamped with the Aquarius stamp in a random pattern. Then she arranged the sterling silver small cast bird blank, the sterling silver oval tag, the gold filled small 6-petal flower and the small sterling tiny flower in a pleasing layout on the blank and connected them with the mini brass nuts, washers and screws. Have you tried the mini screws? They are a quick and easy way to connect components together without soldering or riveting. We have a quick tutorial on how to use them... Honestly, they are too cool. Clicking the image makes it huge! The upclose image is just a click away. 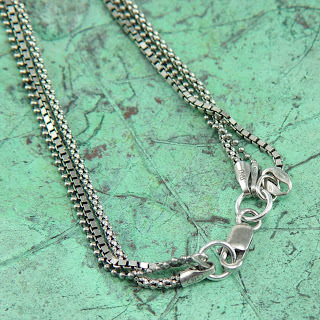 To make them all hang together, she took the clasps off of the ends of each one and connected them with jumprings and reused one clasp for the end. So in celebration of it being Friday and all. I gathered the blanks and brass nuts to make this little goody. Since it is a beautiful day outside and I am feeling the call of summer (which always makes me happy) I have thrown in the dotty diamond and bulls-eye stamps into the mix. My favorite summer piece to wear is something beaded, simple, and eye-catching. And, something I made myself! my favorite piece of jewelry in my summer wardrobe is a sandal pendant line with pink rhinestones, and a breast cancer ribbon on the flat part of the shoe. My mom passed away from breast cancer so this is a special piece and I wear it with my summer fun clothes to honor her memory. My favorite piece is a simple and light personalized name necklace made out of sterling wire. Summer is here and I haven't taken it off in weeks! My favorite piece for summer is a stamped pendant with the word "HOPE" stamped. 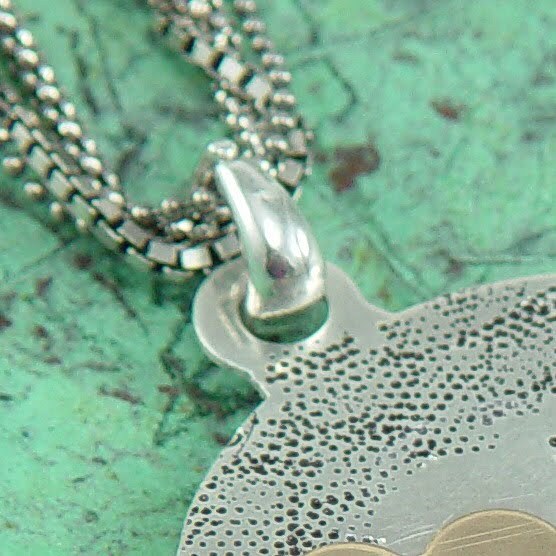 My favorite piece is a necklace stamped with my children's names. It looks great with every outfit, and I always have them close to my heart. my favorite summer piece is a simple 1" sterling circle on a ball chain with the words "even more now". it's what my husband says to me everyday! he had it made for me...i had so many people asking where they could get something like it. so i bought the stuff and started stamping! My favorite summer jewelry is the new cuff bracelet I just made! I just figured out how to make them (thanks for the tutorial!) and they go with everything. My favorite piece is one I made myself, 2 silver rectangles with my girls names stamped on them! My favorite summer jewelry piece is a collection of glass leaves and flower beads simply knotted on green cord. That is a BEAUTIFUL necklace! My fave piece of jewelry right now is my sons fingerprint in ss cut into the shape of a heart! I wear it with his birthstone crystal that has a bead cap with his name and birth date. My fave summer piece is my hand stamped i am blessed necklace. I love a multistrand, rainbow colors paper beads necklace I made - light and colorful! My favorite summer piece is a starfish bracelet that I have had for many years. by far, a janice berkebile inspsired pod necklace studded with beads in yellow and orange hues is my summer favorite. My favorite summer piece is a tiny domed blank stamped with the word "joy". I wear it almost every day. Favorite summer necklace is a small bird with on a delicate chain. It was given to me by my best friend in AZ. We are so far apart and when I wear it I think of her and how I wish it were easier and cheaper to fly there. that is super cute! Currently my favorite piece of jewelry to wear in the summer is the enameled copper piece I just made in the Susan Lenart Kazmer class. I've been wearing it nearly everyday and it goes with everything because of the colors I used. Right now my favorite piece of jewelry is my hand stamped necklace that has my children's names on it. My favorite piece of jewelry is a pendant I stamped the word "Believe" on. I have a necklace that I call my memory necklace. It has things on it that I have had since I was a kid (mustard seed in a glass bottle), favorite beads from when I was a teenager and now things, shells and stuff my girls have given me. Like a dolphin charm that says best friends forever (they each have one). my favourite summer jewelry is an anklet w/ multi coloured beads & a tiny charm. I just created an enameled sea horse charm and suspended it on a copper ring with sea glass, a beach pebble, and a coin pearl. Beachy! Although not summer here in Oz at the moment....my favorite summer piece is my solitare diamond pendant necklace given to me by my husband on my first mothers day. It sparkles in the sun. He designed it himself especially for me. My favorite piece is a necklace made with sea glass colored stone chips woven with a strand of E beads. My favorite summer piece is a brown wax cord with turquoise beads and sterling silver toggle clasp worn to be seen with more dangly beads. Light and summery! I made a charm bracelet with wire looped pink crystals and pearls and silver beads on a silver chain, lots of them that ring and jingle when you swing you hand. I love it! Too bad for me that I donated it to a church auction fundraiser and now an 8 year old girl wears it ALL the time. But I am going to make another for ME. My fav is something made with my own lampwork and then sterlng and copper stampings! I don't have a favourite piece of summer jewellery. Mostly just pull out something simple to wear the year around. I don't wear as much jewellery as I would before I got into jewellery-making. This spring, though, I've often worn my new wirework rivoli pendant. Simple piece: crystal volcano rivoli, prong set using vintage bronze wire (=brownish enamelled copper) on a dark brown waxed cotton cord. Hrm... This makes me think I should plan on making a few simple and versatile (easy to use) pieces for each season. My favorite is my pendant that I made with my kids' names on it. I also hung Swarovski bicones in their birthstone colors. My favorite piece for summer is my pendant with my children's initials! My favorite summer(or any other time of year)piece is the first thing I ever made in metal. My dome ring with copper, silver and bone. I have a lot of favorite pieces of summer jewelry. Most are simple and have a story that goes a long with them which I enjoy telling when someone ask me about the piece I'm wearing. My current favorite is actually a piece that I didn't make myself! It's a simple silver clay pendant with a "J" stamped on it that my friend found on Etsy. She gave it to me as a "thank you" for standing up in her wedding. I like it because it's just right for a casual summer outfit! My Favorite piece of jewelry right now is a dichroic pendant that hangs on a wire choker. The pendant is black with lots of jewel coloredmbits in it. It matches almost everything because it has so many different colors in it. I bought it at a bead show this spring. I love the necklace. Thanksnfor the chance to win the goodies to make it! Too late to leave a comment? I hope not! I love to wear a simple square pendant with my boys' names on it. So sweet and it goes with everything!!! my favorite piece right now is a simple pendant I made that has my daughters initials on it along with a simple swirly design stamp. Love the site!